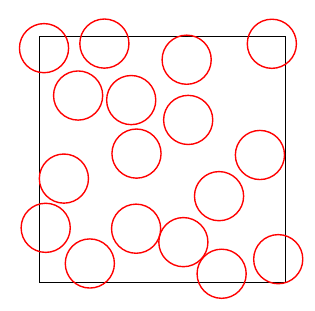 I want to fill a part of a picture with more or less evenly and randomly distributed circles which should not overlap. It would be okay if circles are only partly inside the shape. The density should be like what you see on this page http://zoada.com/html5/brute.html with values 80-100. (But I do not need so many circles, 30 should be enough, I could repeat the pattern). I cannot use a grid and "wobble" the circles a bit: The circles are too large and it simply does not look randomly. Currently I am thinking about a random attempt: Get some random point, measure its distance to existing circles, either paint or throw the point away. Try 100 times and hope that you get the right number of circles (and that it does not take too long). But perhaps someone has a better idea. Here's a macro that implements what you described. It takes four arguments: The width and height of the rectangle to be filled, the radius of the circles, and the number of attempts. For each attempt, a random position is generated. The distances between this position and all existing circles are calculated, and if there's a collision, no circle is drawn. If the circle does not collide, it is drawn, and its coordinates are added to the list of existing circles. Here's a different variation. The idea is to generate a bunch of circles, and then to cull those that intersect. For the culling phase, I used a halfway implementation of Sweep & Prune which speeds things up a bit as far as collision detection goes for large n.
-- problems, so I had to include some checks "if pts[k1]..." etc. Just discovered this old question, and for completeness I decided to add the following answer. Poisson disc sampling seems to be the right way to create this kind of patterns. This question/answer provides an implementation of this algorithm in pure lualatex, allowing its use from pgf/tikz. This loops through trying to place n circles, for each circle it will attempt to place it up to 20 times before giving up. If you've got tightly packed circles it's not much better but for relatively loosely placed circles you can be pretty sure of getting the requested number of circles in a relatively short time frame. Not the answer you're looking for? Browse other questions tagged tikz-pgf circles random-numbers or ask your own question. How to draw random simple closed smooth curves but with the same perimeter? 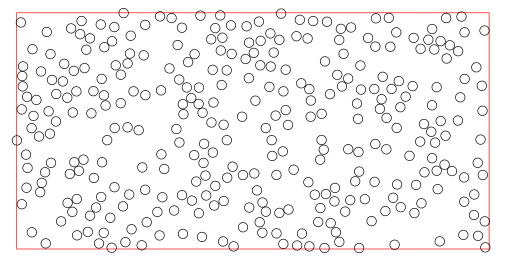 How to draw a rectangle filled with random size circular pattern? 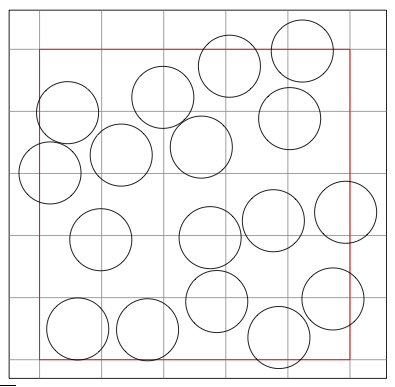 How to fill random spaces with random circles in tikz?